1920 – Fred Squires buys the lot from a recently subdivided farm located at 6723 Holabird Avenue and builds a tavern called Squire’s Café. This is the original and only site ever occupied by Squire’s Restaurant. 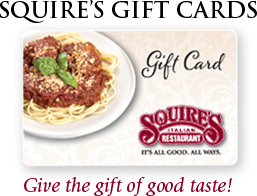 Joe and Mary Romiti buy the business only, still known as Squire’s Café, from Lorraine Squires, the widow of Fred. The startup money was a loan from family friends, Enrico Vellegia and Sabatino Luperini (of Vellegia’s Restaurant and Sabatino’s Restaurant in Little Italy). The first dollar is made by the Romiti Family and still hangs on our office wall today! Mary Romiti cooks spaghetti and tomato sauce in the kitchen of the small apartment upstairs and sells it to hungry factory workers in the bar below. No Dining Room existed at this time. The only dining tables were placed around the large “horseshoe bar” that dominated the one room “restaurant” below their apartment. A small kitchen is added to the main floor of the restaurant and pizza is introduced to the neighborhood. Kitchen is repeatedly expanded to accommodate the quickly growing restaurant and carryout business. Sons Bob and Lorenzo Romiti begin working in the family business. A new bar is added on the parking lot side of the building and the original bar in the center of the room is removed. This triples the size of the dining area. The kitchen is expanded to the full length of the building. The entire restaurant exterior and interior are re-designed and the size of the restaurant doubles to the size that it is today. Lorenzo Romiti retires from the restaurant. Bob Romiti along with his three children, Mary, Robairta, and Joe, currently run the operation of Squire’s Restaurant on a daily basis along with the help of their amazing staff.